I first found out about Stormzone in Glasgow, June 2009 while they were supporting the mighty Tesla on a UK tour. As luck might have it, it was great finding out about a band coming from my neck of the woods in Northern Ireland and with a similar background. Since that night there has been two album releases, “Death Dealer” and “Zero To Rage”. It has been a joy to listen and watch Stormzone develop and progress over the years. Their first album “Caught In The Act” was a different beast all together than the other two previously mentioned. More AOR back then, then things became heavier and darker from Death Dealer onwards. It became proper old school classic metal similar to other bands I have been growing up listening to such as Queensryche, Iron Maiden, Dio etc. Each album has progressed, and with each tour more and more the band would learn and develop from their experiences with their own music and touring with bands such as Cinderella, Stryper, LA Guns, Y&T, White Lion, and more recently Saxon, as well as several European festival slots. There have been a few changes in personnel in the guitar department but now the band are delighted to have found a very capable and compatible band mate in David Shields. Over the past year the guys have been writing and recording for another album. 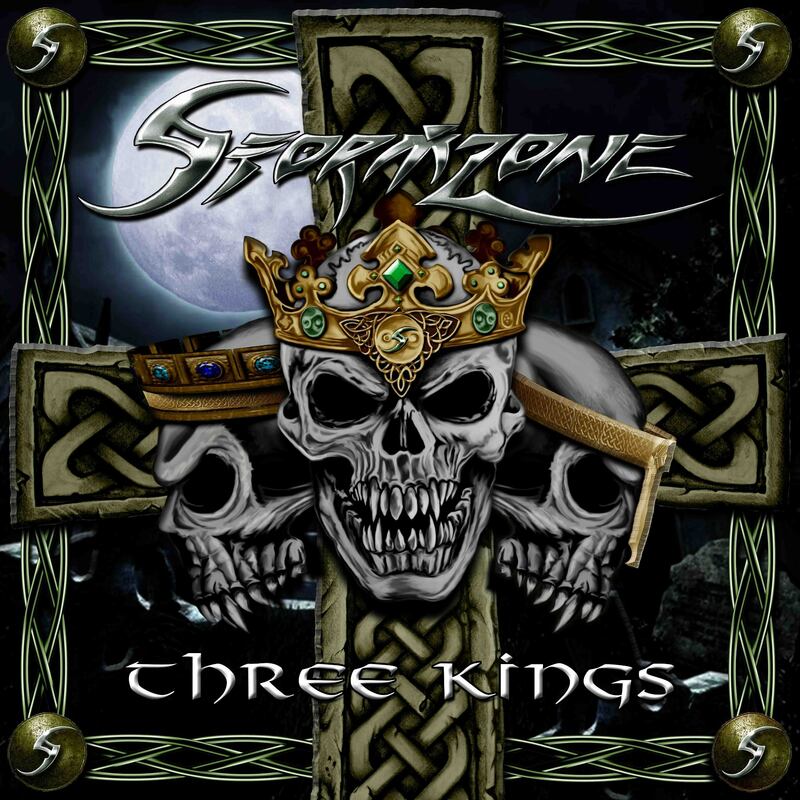 With new management on board and a new label, which I have been told they are extremely pleased with, it is now just about time for Stormzone to unleash their 4th album “Three Kings”…..
And wow, you really do get the sense that this is very much a British Heavy Metal album right from the start, as first song “The Pain Inside” starts off with the sound of an Air Raid Siren, a very military marching snare drum beat and the voice of Winston Churchill with one of his popular speeches. All with a background of stirring gentle guitar notes. Immediately it makes you think of war and fighting. Themes Stormzone have been associated with on previous albums. Then a nice chugging guitar intro with heavier drums and John Harv’Harbinson’s commanding vocals kick into the song proper. This is a belting classic metal sounding song with a nice big chorus. You can feel the sense of pride as the band perform this, and I think that’s what the message is about here. Proud of being united and being as one together and identifying where you’re from. This song may ring true with others from Northern Ireland, where there has been many changes for the better since the troubles many, many years ago. Things get heavier again with “Spectre” and Third track “Stone Heart”. This song carries on with lots of vocal harmonising with the band members right from the off which does sound fantastic. Stormzone do sound like a menacing powerhouse vocally when singing together as one, and this track demonstrates this the most on this album. The chorus is sung first and when the verse comes in things quieten a little, and we get a gentle dreamy like melody, with nice guitar and Harv gently singing, then the chorus comes in again and everything speeds up and becomes instantly harder, loud and powerful as the band explode together as one. This is one of several highlights to me. “Alive” is probably one of my favourite tracks from “Three Kings”. It starts gentle and we get to hear Graham McNulty’s bass so smooth at the start with some smooth guitar sounds. This starts to get a bit heavier just before the chorus, which is huge. Again it explodes at us, and the vocals scale up and down in such a beautiful way throughout and finishes with a lovely heavy guitar riff before going into another verse. There is a bridge which also delights and speeds it up even more, and the solo leads into another different section of song that changes slightly. The song just builds and builds and it flows along just nice. This album never lets up, its just one hard rocking/head banging song after the other and we are treated to what I would refer to as THE classic eighties sounding metal with the song “Night of The Storm”. Complete with classic sounding lyrics, the chorus being “When the lightening Strikes, so begins the night of the storm. When the Thunder bites, you’ll remember why you’re born”. The guitar riffs are fantastic here with some great dual guitar work from guitarists Steve Moore and David Shields. I have had the pleasure of witnessing this track played live at the recent Helfast Festival in Belfast where Stormzone were headlining. This is a superb song played live, and I’m sure will be one of the crowd favourites for a long time to come. There is loads of energy in this one. Next is another highlight for me. Things are slowed down for the Super sweet power ballad “Beware In Time”. This would happily grace any classic metal album and stands up to a lot of the classic power ballads of years ago. It takes you into a dream state for the main. Slow dreamy guitar, some gentle strings in the background, Harv sings tremendously and the chorus is huge. You do actually get lost while listening to this one. The sweetest of guitar solos also compliment the arrangements. I can imagine this song with a nice epic video to accompany it that surely would get good airplay where you would least expect it! The title track of the album “Three Kings” picks up the pace again. With steady hard catchy riffs for the verse and such an infectious chorus that had me humming and singing away. Again like “Night of the Storm“, this has very much has a classic sound in the music and lyrics in that it wouldn’t feel out of place way back in the early eighties standing up against the likes of Iron Maiden. “The Pass Loning” has Davy “Basher” Bates kicking things off here with super fast drumming and nice beats, some gentle clean guitar strumming before it picks up with pace and energy. Dual guitars kick in and heavier bass comes in from Graham. The riffs are awesome in here when the song develops further. The solo is sweet with super smooth guitar sounds. The drums are immense and one of the main features all the way through here. “I am the One” starts like a classic hard rocking number, and maybe sounds a little different than most of the tracks on the “Three Kings” album. It does have a hard edge but not the heavy metal sounds as heard previously. It doesn’t make it less appealing than the other tracks though, it is actually another highlight of the album for me and with lyrics that Ozzy Osbourne would be proud of. “Run for your life, I am the madman. I’m the one. What I am, I’m the madman and your time has come. I am the one” Fantastic stuff! It is another song where during the chorus the vocal harmonies sound amazing when other band members join in. “Wallbreaker” is probably the fastest and heaviest song on the album with again superb drumming from Basher Bates. The chorus is highly infectious with the band singing in a slightly higher pitch and with multiple vocal tracks wonderfully layered over each other and Harv again singing over those vocal tracks. Though I did have to listen carefully because at times I could have sworn they were singing “Ballbreaker”! There is a lot happening in this song and it sounded like a lot of fun to do, or a lot of pain for Super Steve Moore to try to mix! “Never Trust” starts gentle and is soothing with some nice piano and beautiful guitar playing but then changes into quite a fast little number, and another huge chorus develops which is catchy and quite a sing-along moment. This is one the band could have fun with playing live and getting some crowd participation going I’m sure. The song ends like it begins, very mellow with soft piano sounds. “B.Y.H.”. Which stands for Bang Your Head, is another highlight for me. There is a lot of multiple band vocal singing during this one, with great catchy heavy riffs. As the title suggests this is one where everyone will be head banging to. It is a lot of fun and is a salute from Stormzone to the Metal Gods from the past and in general. They certainly are ensuring that metal music carries on and stays alive, as suggested in the lyrics of this song. This is going to be huge and popular when done live. The last song on the album “Out Of Eden” is my favourite. This song leans heavily towards the style of old Queensryche to me, which really is music to my ears. It starts slow, with simple guitar and drums which picks up into a faster rhythm and a great riff develops and the biggest of melodic choruses I have heard for a very long time. The band are all smoking hot together in this song. There is also a lot of brilliant dual guitar playing, something Queensryche are renowned for. The solo is also majestic in here leading into a final hoorah for the chorus. This is for me the best song on the album and what a way to end this album. To summarise what I have heard. It was a total mindblow on my first listen. Every song was instantly likeable. Nothing seemed out of place and each song flowed easily into one another as the album moved along. The songs grew and developed deeper the more I listened to it, with huge melodies and plenty of fantastic riffs throughout. Certain elements and styles could be picked out. The tracks are huge and they are all strong. There is no weak link on this album. It is so easy to listen to from start to finish with a huge grin on my face because of various reasons. I haven’t heard anything like this for a long time! I know it’s Stormzone and listening to it you have no doubt it is, but these guys have developed even more since their previous album release “Zero To Rage”. That was a fantastic album but this one raises the bar again. The album cover artwork was designed and created by vocalist John “Harv” Harbinson with input from the other band members. The art is just outstanding and brings to mind all the old classic albums of yesteryear that you just loved to buy just because it had a “cool” cover. There is quality all the way through. I didn’t think I would ever give an album full marks, because nothing is ever perfect, right? That opinion has changed with this album. The band members in Stormzone have put a hell of a lot of time, effort, commitment, blood, sweat, and who knows, maybe even tears too while making this album and it really does show. It is difficult to think of many other albums that have had a similar kind of effect on me where it instantly grabs you by the balls and heart, and manages to stay there each time you listen to it. It does manage to bring you back to the classic metal sounds of the early eighties, without it sounding clichéd. 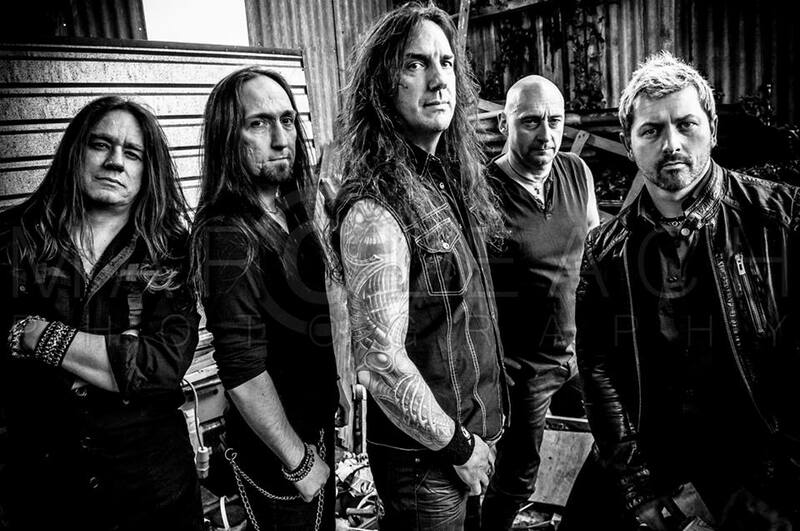 Stormzone have redefined and rejuvenated classic old school British Heavy Metal. “Three Kings” stands up to all the greatest Classic Metal albums of the eighties and easily beats anything that has been done ever since. It may be the year 2013, and with 13 tracks the number 13 may be unlucky for some, but surely will be a lucky one for Stormzone this year. Stormzone deserve a place up there with the big guns!